Well, well, well. People have been asking me if I was going to start home schooling our three-next-month year old. I keep thinking, "Why?! He's only three!" And to some extent, I still think that. However, he's also becoming quite bored and mommy has been doing a poor job of being very creative of late. So I figured, "Why not start on something?" 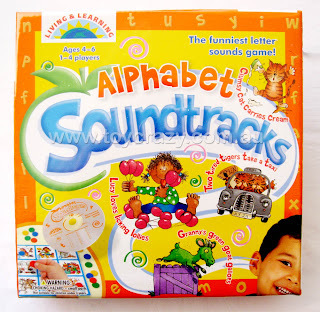 The Alphabet Soundtracks Game is awesome. Formerly produced by Living & Learning it was bought out by Galt company which is in the United Kingdom making it a little hard to find. However, if you have a little kid who is interested in learning which letters make what sounds then this is a pretty awesome option. We've been playing it once a day and it takes about 20 minutes to do so. Bookworm1 is content to play the game through to the very end which is a selling point for me! The game is like unto Bingo, with a soundtrack that you play to read silly sentences which emphasize the letter sounds. "LlllUCY, LlloooVES, LllICKING, LllEMON, llllllLLlllollipops!" Your job is to find the corresponding picture on your "bingo" card and place a marker over that letter. It's a hit. 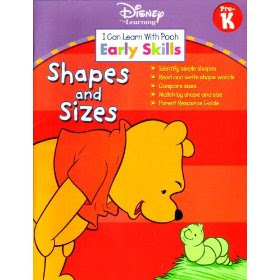 I also picked up an alphabet color and dot-to-dot book at the dollar store which produced great delight and glee this morning as we did the pages for the number 1 and the letter A. Lastly, we picked up I Can Learn With Pooh - Early Skills Pre-K - Shapes and Sizes which was ecstatic fun because it has POOH in it! He already knows his shapes, but we've not yet approached the concept of tracing or dot-to-dot and this book has a fair amount of both inside of it. Bookworm1 has never much been into coloring but I discovered today that that might be because he's never seen us do it. I picked up a color and was working with him and all of the sudden he seemed to be very enthusiastic of coloring the pictures. So maybe the problem was me. We'll see. At any rate, being that he's three, I'm not really concerned that we have this intense "schooling" experience with a great deal of structure. Right now he can identify letters A-E consistently, along with a smattering of others letters sprinkled throughout the alphabet. If he continues to pick up on the concept that specific letters make specific sounds and if he learns how to trace, I'll be happy. I don't think I would ask for much more than that the ripe old age of three. Mostly, we're doing this because he's bored and I need motivation to actively engage myself with his learning process. If I blog about it then I feel additional pressure to focus on him, especially with the imminent arrival of Bookworm2. Then maybe someday Bookworm1 will be able to accurately read what things say, instead of just making them up! Yup, he's taken to picking things up, running his fingers along with the words and telling me "what it says." A few weeks ago we were in a store, well past lunch time and he was periodically reminding me of his hunger pains. He picked something up that had letters on it and said, "Mommy look! It says, "I need FOOD!" Oooh, won't it be fun to "talk shop," though? 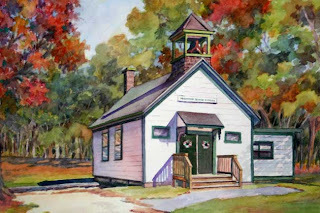 I can highly recommend Sherry at Semicolon's Picture Book Preschool. It would give you a little structure, and of course it's based on books! (and also includes a Biblical character trait). Well, since I have a 3 year old as of 3.5 weeks ago I feel the need to chime in. What you are doing is perfect!! Low stress. Low pressure. For you and for him. It's important. Especially with #2 coming any day!! My PreK 4 & 3 year olds want to "do school" like my 1st grader. So, my 4 yr old is using a penmanship workbook and the 3 year old is just drawing (they aren't developed enough at this age to do fine motor skill work). We also sit with alphabet flashcards (again Walmart) and the 3 year old names the letter while the 4 yr old tells the sound. This sounds like the perfect way for your three-year-old to learn! We're homeschooling our six year old, and I've been picking up workbooks from the dollar store and cutting them to make games with index cards. It's been working so well, and my son is having so much fun, I forget he's learning until we sit down with a book and I realize how many words he can read now! It says I need food. How cute is that?!? When my guys were about that age, we really enjoyed the Letter of the Week curriculum (free, online). I always needed that little bit of structure/direction for me. That game sound fun. My little guy is 2, I'm looking forward to starting school with him. But right now we just work on motor skills. Welcome to the wonderful world of homeschooling! A perfect start, fun and interesting for your little one. Thanks for sharing your week.